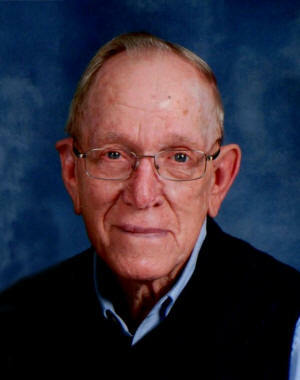 [June 19, 2017] LINCOLN - Donald A. Ramlow, 89, of Lincoln passed away on Friday, June 16, 2017 in his home surrounded by his loving family. Donald A. Ramlow, 89, of Lincoln passed away on Friday, June 16, 2017 in his home surrounded by his loving family. Donald was born on August 6, 1927 in Hartsburg, the son of Carl and Lena (Skonetski) Ramlow. He married Vera Hutchison on October 17, 1948 in Broadwell. She survives in Lincoln. Donald is also survived by his children: Judy (Dean) Kukuck of Lincoln, Donna (Bob) Twist of Elkhart, and Gary (Lisa) Ramlow of Lincoln; five grandchildren, Dawn Peterson, Laura Stephenson, Joel Kukuck, Christopher Ramlow and Betsy Ramsey, four great-grandchildren; his sisters: Ruth Ackerman of Lincoln and Lena Ingram of Lincoln. Donald proudly served his country in the United States Army from 1946 to 1947. Donald was a very active member in the Lincoln Christian Church. He was a member of Jolly Seniors and active in the Harvest of Talents. He loved woodworking and making things for his kids and grandkids and loved to garden. He was a great husband and loved his family. Services for Donald will be held at 10:00 a.m. on Thursday, June 22, 2017 at Lincoln Christian Church in Lincoln with Tim Searby officiating. Visitation will take place from 4:00-7:00 p.m. on Wednesday, June 21, 2017 also at the church. Burial will follow the services at Zion Cemetery in Lincoln where full military rites will be accorded by the Lincoln American Legion Post #263. Memorial donations may be made in Donald’s name to Jolly Seniors or Land of Lincoln Honor Flight. 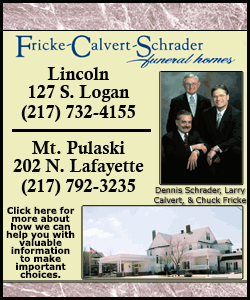 Services have been entrusted to Fricke-Calvert-Schrader Funeral Home, Lincoln.